There's a new book out from Scholastic and author Nicole Mortillaro. 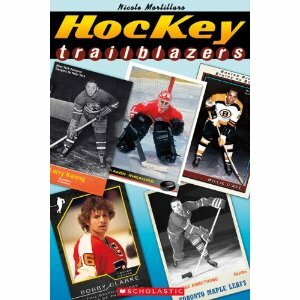 Hockey Trailblazers is a book aimed at young readers looking for inspirational stories from real life hockey heroes. It is a well written, well presented juvenile literature offering. I would definitely recommend it for young, possibly reluctant, reader/hockey fan in your life. - Willie O’Ree, who challenged racial barriers as the first black player in the NHL. - George Armstrong, the first aboriginal player to make it big in the NHL, played 11 seasons as the Captain of the Maple Leafs, and proved his talent many times over. - Bobby Clarke was the first player with diabetes to play in the NHL. Knowing his place in hockey history now, it is laughable to think he was dismissed as "too fragile" to play the game. - Manon Rhéaume, the first woman to play pro hockey. - Larry Kwong, the first Chinese-Canadian in the league. This fascinating book includes photos of all the players and sidebars about others they inspired, including Jarome Iginla, Hayley Wickenheiser and Jordan Tootoo. It encourages young fans to consider hockey, and the meaning of determination, from a whole new perspective. There is also a sample passage available on the Scholastic website. Nicole Mortillaro is a children’s book editor and an avid hockey fan to boot! She has written four previous works of non-fiction for young readers, including biographies of Jarome Iginla and Bobby Clarke. She lives in Richmond Hill, Ontario with her daughter.